A reader has drawn my attention to this document, written by Professor Paolo Debertolis on 11th June 2014, whose purpose is that of a “formal response to attacks” on his research group (the SB Research Group). This document, which contains some untruths, requires a few clarifications on my part. 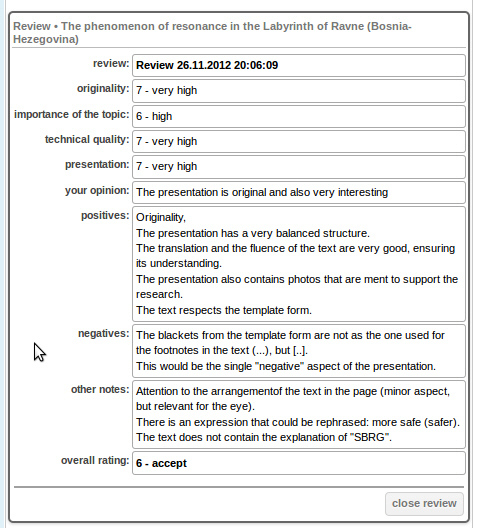 In this case we are speaking about Irna’s web site which claims to tell readers the truth about Bosnian Pyramids. I do not know where Professor Debertolis saw any claim that I have set out to "tell the truth" about the "pyramids" in Bosnia. Since 2006, this site has been exclusively devoted to examining the documentation provided by the Foundation on the subject of the pyramids: I’m trying, not just to state, but actually to show, that the so-called scientific evidence offered by the Foundation is nothing of the sort, and that none of the "evidence" could withstand a basic critical examination. The readers should know that this anonymous blogger, Irna, gives the illusion of being an academic archaeologist. Yet again, I don’t know where Professor Debertolis gets this idea from. I have never claimed to be an archaeologist; on the contrary, I have always taken care to clarify any perceived misunderstanding of this point. I have also been at pains to state that my background is in geomorphology, not in geology. My position, as mentioned above, has always been very clear: I do not resort to arguments from authority; the critical analysis to which I subject the documents published by the Foundation and its sister organisations is within the range of anyone with even the most perfunctory grasp of science. Professor Debertolis should do his homework on the precise nature of "l’agrégation" in France. However her knowledge of Bosnia language and affairs is because she is of Bosnian origin. The reason for all her attacks against our group of research (SBRG) is unclear, however more recently she promotes the sale of her e-book for €10.45 in which she argues the Bosnian pyramids are only a pseudo-archaeology affair. The book in question, Les pyramides de Bosnie, was a paperback - and now, in 2015, also an e-book ("Book-e-book" is the name of the publisher). It is published as part of a collection ("Une chandelle dans les ténèbres" (fr), [A candle in the darkness]) whose editor is Professor Henri Broch (fr) of the Nice Sophia Antipolis University. The book is therefore anything but self published. We have also researched in other European countries, in particular England, Italy, Croatia, Malta, Serbia and Macedonia, but Irna has no interest in our research here. She is interested only in our Bosnian activity. This is absolutely true. The research activities carried out by the SBRG in Italy, England or elsewhere don’t hold any interest for me within the parameters of this blog. It is devoted to the Bosnian “pyramids” and to some other examples of “pyramidomania”, and not to archaeology in general, archaeoacoustics, or any of the subjects with which the SBRG might happen to be concerned. The sole object of analysis here has been the SBRG’s activity in Bosnia, which has revealed a disturbing lack of scientific rigour in the approach employed by Professor Debertolis and his colleagues. No, it isn’t the validity of archaeoacoustic methodology per se that I am questioning. See my statement here : "Archaeoacoustics – and we should here draw a distinction between archaeoacoustics, and musico-ethnology or the archeology of music - is a relatively recent discipline located at the crossroads of several scientific disciplines. It is concerned with the study of the properties of sounds at archaeological sites, or of archaeological artifacts. One of the principal difficulties of the discipline is to establish the intentions of those responsible for construction or manufacture. We can identify the acoustic properties of a site or an artifact, but it is usually very difficult to determine whether these properties are the result of purpose, or of chance - many caves for example, have very specific acoustic properties, without human beings having anything to do with this. This is an area where one runs up against the best and the worst". I am therefore drawing attention to the danger, of which professional archaeologists are well aware, of archaeoacoustic over-interpretation, the forced interpretation of observed phenomena. I find that the worst of these over-interpretations, as I have shown in this article, is the temptation – to which Professor Debertolis has fallen victim – to put the cart before the horse when it comes to concluding that a particular site is an archaeological one because of the presence of interesting acoustic features; and going on from there to invent a mediaeval monastery in a location where there was never one before; or, in the case of a mining tunnel of probably recent date, to attribute it to the Neolithic without any archaeological discussion, solely on the basis of the observation, in these locations, of infrasound or resonance phenomena resembling those observed in other locations. 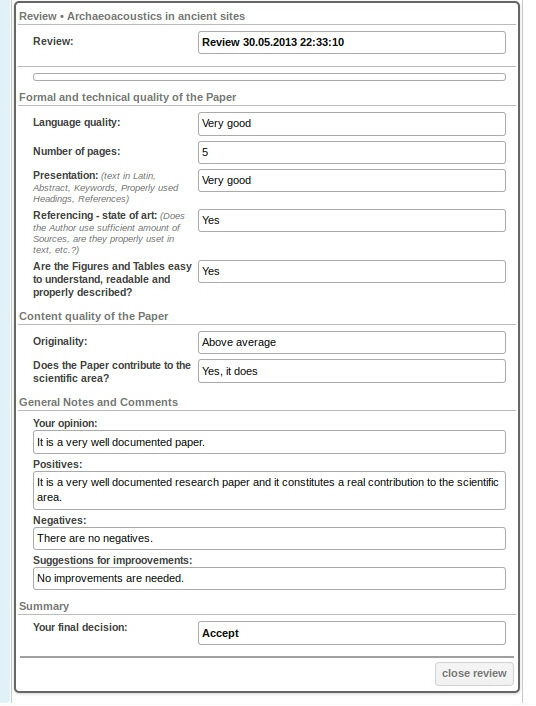 Given that Professor Debertolis has himself made available the opinions of his reviewers for two of the articles, here and here, the reader can easily get an idea of the quality of the reviews, and the level of the review panels of these virtual conferences. The last article produced by Irna attacks this conference and at the same time reveals her low scientific knowledge and lack of understanding as to how the academic world works. Professor Debertolis is referring to this article. Here, besides commenting on the scanty content of the reviews, and the total absence of archaeologists and acoustics experts from the review panels, I also drew the reader’s attention to some questionable aspects associated, not only with the conferences, but also with the publishers of the conference proceedings (as well as of various science journals), Sci-Pub. At that particular time, some features of the affair were also giving rise to general concern, so much so that Sci-Pub was included in the list of predatory publishers run by Jeffrey Beall, without me having had any hand in the matter at all! One only has to ask, what is real Irna’s motivation in discrediting all our research carried out in Bosnia? Why is it that the SBRG, described as a “university project” … “supported by the University of Trieste”, doesn’t appear in that capacity anywhere on the university website? Dental Archaeology has become prof. Debertolis’ main field of research. [...] At present he is studying archaeological finds of the Visoko Civilization who built the Bosnian pyramids, re-discovered in 2005 in Bosnia-Hercegovina. Necropolis are emerging besides the pyramids, and their study is drastically changing the traditional historic framework of the Neolithic Era in those regions. when there have been no finds on, under, or around the “pyramids,” of any human remains on which, as a qualified dental archaeologist, he could have worked? Why does he continue to talk about the “Bosnian Pyramids,” and about the “Visoko civilisation that built the pyramids”, and to reject the suggestion that Mr. Osmanagic’s initiative is a pseudo-archaeology project, when his own geologist writes in the very report prepared at his request: "As regards the constituent materials and their stratification, the so-called Pyramid of the Sun is the result of continental Miocene clastic-terrigenous sedimentation; the shape of the hill, the tilt of the strata and their dislocation, as well as the cracking that gives the various layers their pseudo-pavement form, are due to post-Miocene geomorphological modelling, together with local and global tectonic phenomena." Moreover, why does he continue to conceal this report, which has never been made public, and can be read only by those who have access to the private section of his site? Why has he never rectified certain glaring errors in some of his articles, contenting himself with merely removing the articles without publishing any correction? Which particular archaeological and historical features enable him to state that the hill of Visocica is “a site considered sacred for millennia” and that the fortress of Visoki, instead of being the stronghold recognised as such by Bosnian historians, was actually a monastery – whose traces he accuses Bosnian archaeologists of removing? Attacking me for my chosen anonymity, my supposed lack of qualifications, or my motivations, will not make any of my own questions the less legitimate. This predatory publisher also seems to have completely vanished from circulation; its site is inaccessible, along with all the “science journals” in its stable. I see that Professor Debertolis has recently updated his article (scroll down to Aggiornamento 28 Luglio 2014 [Trans. - Update 28 7 14]). Professor Debertolis apparently takes exception to the link lately posted on Le Site d’Irna to the Italian, French and English versions of the articles that originally appeared on the Eclisse Forum site (unfortunately no longer in operation). I suppose all that we can do is to hope that, at some future date, the good Professor does eventually see fit to address these questions. * (See Le Site d’Irna passim).